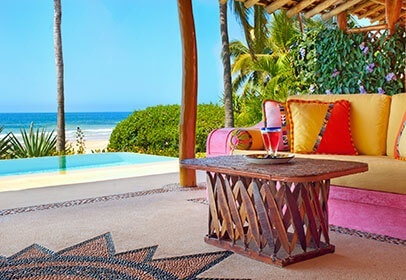 Created by Isabel Goldsmith-Patino, Las Alamandas is a secluded sanctuary on Mexico’s Costalegre, located within a 700-hectare nature reserve peppered with palms and wild flowers, laced with miles of beach. The resort is named after a yellow flower that adorns the main road leading to the hotel and can be found in other locations within the region. 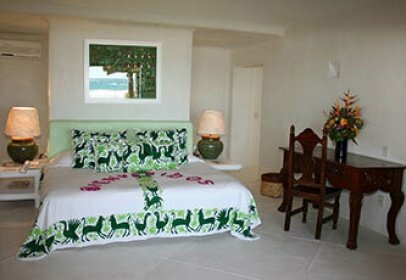 With only 16 suites, the resort’s first attraction is its privacy, which has brought several celebrities to vacation here. It also has a wide selection of areas where guests can enjoy their stay, whether in the suites, within the main hotel areas or among the outdoor areas within nature. From the moment you arrive at the hotel, the staff are on hand ready to attend to your every need without being intrusive, receiving you straight away in your suite with a refreshing margarita to mark the start of your vacations. 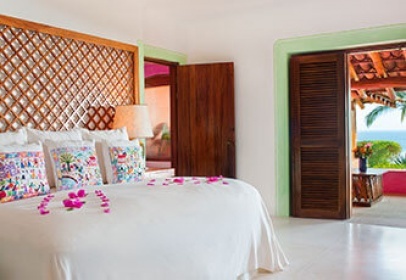 Each room has been decorated by the owner who has sought to balance Mexican details with modern touches to create a unique atmosphere. Suites are spacious including relaxing areas such as balconies or terraces with loungers, sun beds, jacuzzis or plunge pools. Whether you visit with friends or family, you will find the ideal suite. You can even rent a whole villa with 2 or 3 bedrooms providing space for all members of your group so that you can be together while each having his or her own space. It has a gallery where you will find books you can read during your stay and satellite TV. Here, comfortable furniture invites you to share conversations with your companions and pass the time. In the evenings, one of the best shows is to observe the starry sky from a hammock or from Bar Azul. The variety of activities to be enjoyed at the resort, starting with its four private beaches. Each beach has a different shape, size and character and can be reached by enjoying beautiful walks or horseback rides. 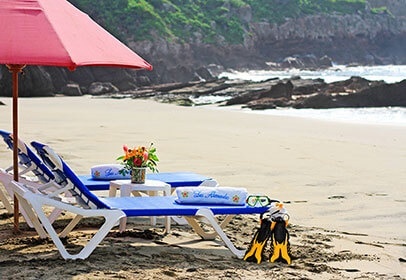 Once you arrive, you can snorkel or surf, or simply relax asking your concierge to organize a private picnic (with loungers included for greater comfort) in any one of the beaches. You can also take boat tours on the Pichichis lagoon (named after the birds that visit here during the winter) or on the river; in both cases you may enjoy a picnic. Being so naturally blessed with the beauty of nature, we also recommend a bird watching tour where you can see more than 270 species of birds as well as other animals on the trail, including deer, porcupines and iguanas etc. Within the resort grounds, you can also enjoy several sport facilities, such as a fully equipped gym, and yoga classes are available on request. There is a playground for children which is sure to become their favorite place. For those seeking romance, you can take pleasure in two stunning lookout decks where you can watch the sunset or enjoy a wine and cheese platter. 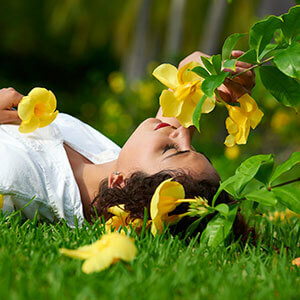 It is an ideal place for those who like to commune with nature and dedicate time to the pleasures of total relaxation. 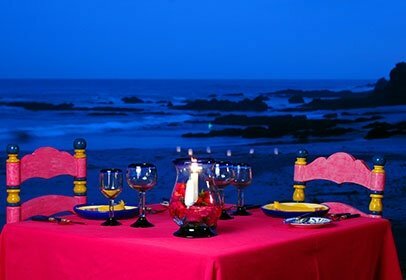 It is a site that also lends itself to romance, so honeymooners and couples can indulge in a few days of absolute privacy here. It is also great for families, especially for the smallest members, who love outdoor activities. All suites have a safe, telephone, air conditioning, fan, TV, DVD, minibar and iPod dock, plus beach bag, umbrella and pillow menu. 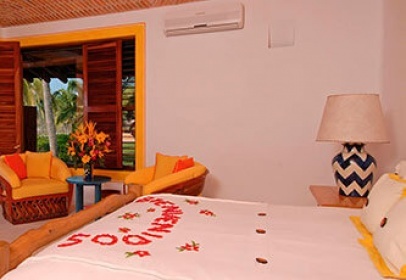 Offers a king-size bed, bathroom with shower and tub, and a terrace equipped with sofa and area for al fresco dining with views of the colorful gardens of Las Alamandas. There is also an intimate rooftop terrace with a large daybed shaded by a pergola that is totally private for sunbathing or gazing at the stars. 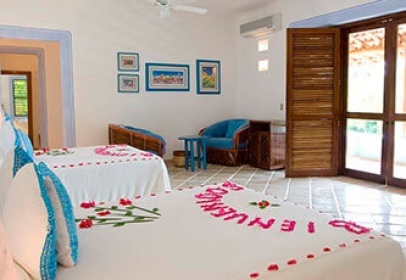 The only suite in Alamandas offering two queen-size beds, Azul Junior features an en suite bathroom and a spacious veranda with a lovely terrace with a sofa for afternoon siestas and an area for al fresco dining. Features a king-size bed, en suite bathroom, a small veranda with a sofa and a hammock for afternoon siestas, and an area for al fresco dining. 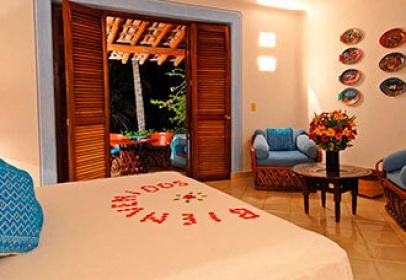 Offers spectacular ocean and garden Views, and occupies the entire second floor of the Villa Azul. 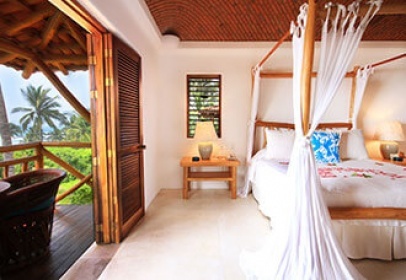 Consists of a bedroom with king-size bed, a large sitting room, en suite bathroom, and a spacious shaded veranda with dining area and sofa for afternoon siestas or enjoying stunning views of the entire resort. It also features an exceptional rooftop terrace with panoramic views that is furnished for sunbathing or stargazing in private. 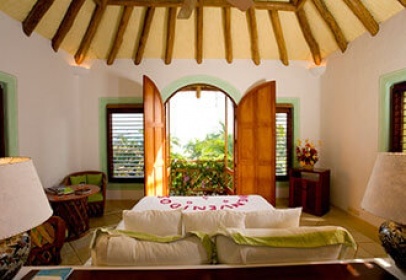 Deluxe Bedroom with king-size bed, en suite bathroom, an intimate rooftop terrace offering spectacular views of the entire resort, an al fresco dining area and a large daybed shaded by a pergola that is totally private for siestas or gazing at the stars. Deluxe bedroom with a king-size four-poster bed, en suite bathroom, lovely terrace for dining al fresco complete with a sofa for afternoon siestas, and an outdoor Jacuzzi tub and shower. There are comfortable chaise lounges set up for sunbathing on the manicured lawns. 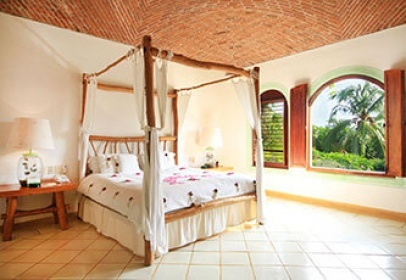 Offers a Deluxe Bedroom on the second level of the villa with magnificent panoramic views of the Pacific. It features a king-size bed, en suite bathroom with double shower and oversized tub, separate walk-in closet, lovely roof top terrace with a spectacular day bed and outdoor Jacuzzi tub for sheer therapeutic pleasure. 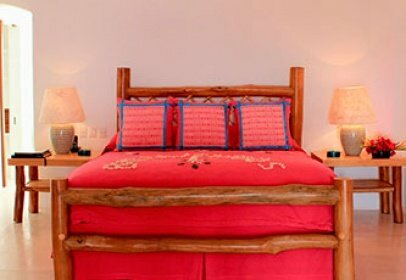 Offers a Deluxe Bedroom on ground level of the villa with a king-size bed and en suite bathroom with double shower and oversized tub, separate walk-in closet, lovely outdoor terrace for al fresco dining complete with a sofa for afternoon siestas, and a private outdoor Jacuzzi tub for sheer therapeutic pleasure. With its own private entrance, the Domo King offers a king-size bed, en suite bathroom with vanity and separate walk-in closet, and a TV den with sofa bed. 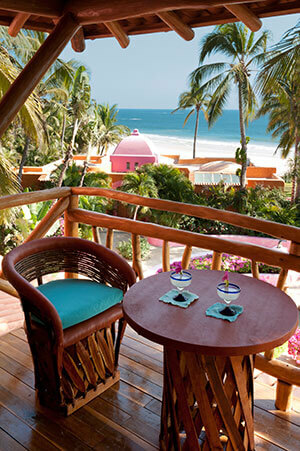 There is a small veranda with a lovely terrace with a sofa for afternoon siestas and an area for al fresco dining. Deluxe bedroom with a king-size bed, spectacular en suite bathroom with ladies vanity and separate walk-in closet, and a cozy TV den with sofa bed able to sleep an extra person. The suite has beautiful polished white cement floors throughout and a lovely outdoor terrace with a sofa for afternoon siestas, an area for al fresco dining, and a very private outdoor Jacuzzi for ultimate relaxation and pure therapeutic pleasure. 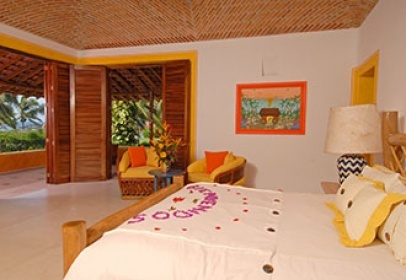 Deluxe bedroom on the upper level of the Casas Isabel Villa offers a king-size bed, large bathroom and closet. 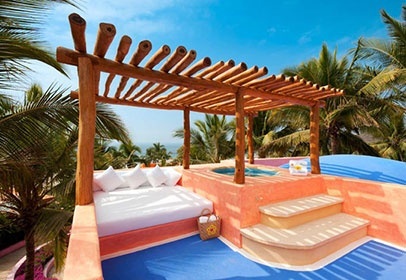 The suite’s private rooftop terrace is equipped with a private Jacuzzi and a fantastic daybed ideal for afternoon siestas, enjoying the stunning ocean views or stargazing at night. Deluxe bedroom with a king-size bed, large en suite bathroom with walk-in closet, oversized tub, and separate double shower. Adjacent to the bedroom is a large TV den with sofa bed, a lovely outdoor terrace for dining, private outdoor Jacuzzi, and a relaxing sofa for afternoon siestas or taking in the panoramic ocean views. Deluxe bedroom with a king-size bed, large en suite bathroom with walk-in closet, oversized tub and separate double rainforest showers. Offers a lovely oceanfront terrace for al fresco dining, with a cozy sofa for open-air relaxation and afternoon siestas, and a private Jacuzzi. TV, DVDs, iPod Doc, Full Mini Bar. 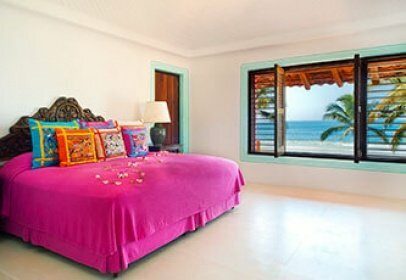 Offers a spacious king-size bed, large en suite bathroom with walk-in closet, oversized tub, double shower, and a private outdoor Jacuzzi for two with lovely ocean views. Adjacent to the bedroom is a large TV den with a sofa bed and stunning ocean vistas. There is a spacious entry with guest powder room that leads to a luxurious master living room with large sliding doors opening to a magnificent outdoor veranda with a terrace, sofa and hammock for afternoon siestas, and an idyllic retreat for al fresco dining. 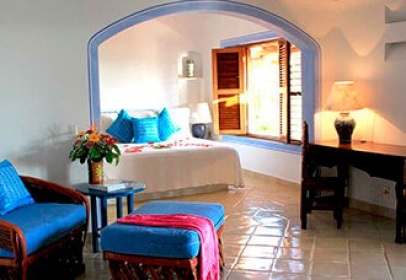 Offers a spacious king-size bed, large en suite bathroom with double shower, bathtub and spacious en suite dressing room. A cozy TV den with a sofa converts into a bed for children. A luxurious master living room with large sliding doors opens to a magnificent outdoor veranda with large terrace complete with sofa, hammock and an area for al fresco dining. There is also a fabulous and very private outdoor daybed for afternoon siestas or lounging beside the suite’s refreshing splash pool with integrated Jacuzzi. Offers a large master suite with king-size bed, luxurious and spacious en suite bathroom with walk-in closet, oversized tub, separate double showers, and a cozy TV den with sofa bed. 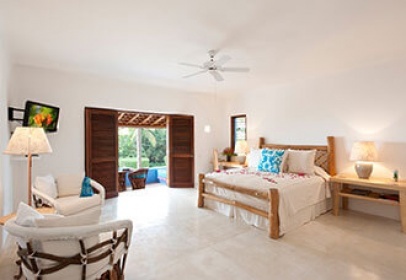 Just off the master suite is a fabulous oceanfront terrace with a private spa, complete massage area and Jacuzzi. The Presidential Suite has a spacious entry with guest powder room that leads to a large living room with full bar and table game area, an outdoor veranda with a large terrace and corner sofa for afternoon siestas, and an area for al fresco dining. Just beyond the outdoor veranda is the suite’s own private infinity lap pool with stunning ocean views. Sol Presidential also offers an additional Superior bedroom with queen-size bed and en suite bathroom. Room cancellations can be made up to 48 hours prior to your scheduled arrival; however, if you cancel after this time, you will be charged for one night’s stay. One night stay will be charged. Between December 20th and January 6th the total stay will be charge. Use of sport facilities, one hour horse back riding, use of bikes ad lend of DVD's. Rates do not include 19% taxes nor 11.6% service. Check-In: 3:00 p.m. Check -Out: 12:00 p.m. Upon request and for an additional cost, the hotel offers transportation to and from both Puerto Vallarta and Manzanillo airports. Las Alamandas can also offer private air transportation from Puerto Vallarta airport upon request and for an additional cost. 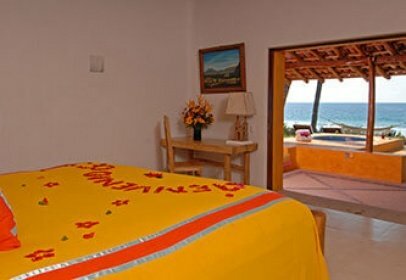 To complete this magnificent refuge you can choose from a variety of massage services that could take place in the comfort of your room or in a palapa infront of the sea by the expert hands of their therapists. The Oasis restaurant offers a selection of contemporary Mexican cuisine with a menu that changes daily to provide greater variety to its guests. The stars of the menu are fish and shellfish, as they are purchased daily from local fishermen. "From the garden to your table,” most of the fruit and vegetables you will savor are grown on the resort’s grounds. 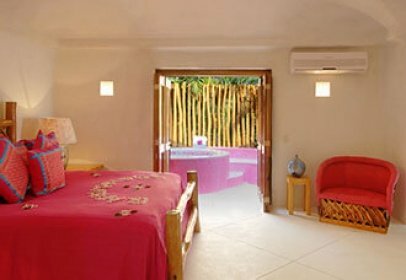 Besides dining at La Palapa Beach Club on the waterfront or in the Oasis Restaurant, you can also enjoy dining in the privacy of your room. Bar Azul is located on the gallery’s terrace and is the ideal place to savor delicious margaritas of all kinds of flavors and delight in the starry skies that this region has to offer. To complement this magnificent retreat you can choose from a variety of massage services delivered by the hands of expert therapists, which you can enjoy in the comfort of your room or beneath the beachfront palapa.